Well, we saw this coming, although it's noteworthy that we'll be playing in Dallas at the new Cowboy's Stadium...and it's also noteworthy that this game will be the opener for 2012. Alabama will be the home team, Michigan will be away. DALLAS, Texas -- The University of Michigan football team will face the University Alabama in the 2012 College Football Kick-off Event at Cowboys Stadium in Arlington, Texas, on Sept. 1, 2012. The game will be televised nationally in primetime. The Wolverines will be the away team with the Crimson Tide designated the home team. The game officials will be a crew from the Big 12 Conference. This will be the fourth time that Michigan faces Alabama in school history, and the first contest played during the regular season by the two programs. All three previous games between the Wolverines and Crimson Tide were played in bowl games. 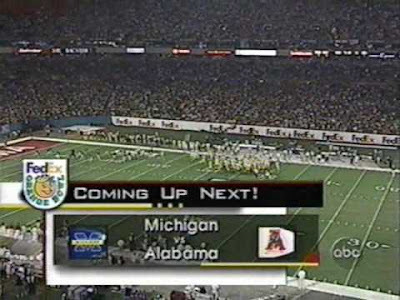 Michigan defeated Alabama by a 28-24 score in the initial meeting, the 1988 Hall of Fame Bowl held in Tampa Stadium. The Crimson Tide got the better of the Wolverines in the second meeting in Tampa, winning a closely contested 17-14 game in the 1997 Outback Bowl. The most recent match-up between the two schools is arguably the most exciting bowl game in Michigan history. The eighth-ranked Wolverines edged the fifth-ranked Crimson Tide, 35-34, in overtime to claim the 2000 Orange Bowl title. Tom Brady completed 34-of-46 passes for 369 yards and four touchdowns in the winning effort. He tossed a 25-yard TD pass to tight end Shawn Thompson and Hayden Epstein converted the PAT as Alabama scored but was unable to convert the PAT in the first overtime session. It was the first-ever overtime game in school history. With the addition of the Crimson Tide, the Wolverines are looking to fill two slots on their 2012 schedule. Both open dates are scheduled to be played at Michigan Stadium on Sept. 8, Sept. 15 or Sept. 29. The other previously scheduled non-conference game is Sept. 22 at Notre Dame.